Leo B. Kennedy has a unique voice among children’s book authors. Parents have written about the travails of raising a child with autism, adults have written memoirs about their personal experiences on the spectrum, and recent novels have been written from the supposed perspective of a person with autism. But where are the children’s fiction books written by a person who actually has autism? Devin and the Greedy Ferret is the first of its kind. Leo writes a fast-paced, compelling story with characters that are quirky but credible. Their sometimes absurd reasoning and outspoken motivations will entertain and resonate with middle grade readers, whether they have autism or not. 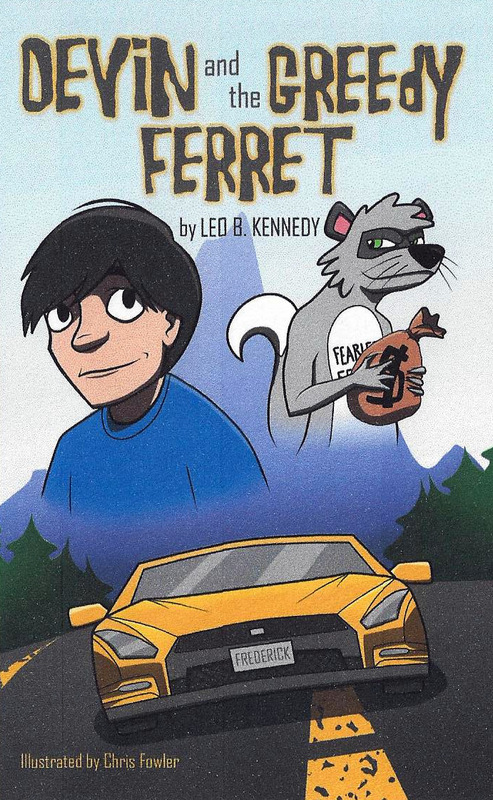 The Story: Devin and his friends think it will be cool to kidnap the school mascot, but when they try to hide from the police, a run-in with Frederick Ferret causes new problems. Now only Devin can save his friends from . . .
Leo was diagnosed with autism at the age of two. With the support of inspiring teachers and community members who recognized his strengths and potential, he is reaching well beyond the dismal future forecast by naysayers encountered along the way. If you’re in Nashville, come to the launch party! for updates and party information. (Many thanks to the Kennedys for writing today's post. Go Leo! YAY, Leo! Thanks for sharing SM! I'll have a video of Leo up next week, Wed. 4/10 via LeisaHammett.com YAY!